The Wolkonsky estate lies on a north-east/south-west ridge of land formerly known as the Vigna Falcone in the south-east of Rome. Down the 350-metre long spine of the site run thirty six arches of the Neronian aqueduct, a spur off the Claudian aqueduct which brought water to Rome from fifty miles east. The estate, then agricultural land and much larger, was bought in 1830 from members of the Massimo family by Princess Zenaïde Wolkonsky, an aristocratic and highly gifted Russian émigrée (and former mistress of Tsar Alexander I). She commissioned Giovanni Azzuri to design a small villa as a retreat from her apartments in central Rome. He built a delightful and informal house around three bays of the aqueduct, with wonderful views of the countryside. Zenaïde’s main feat, though, was to create a huge romantic garden, full of scents, colours, Roman artefacts, vistas and mysteries, where she entertained the finest of Europe’s musical, literary and artistic worlds throughout the 1840s. She died in 1862 and the estate passed, through her son Alexander (who considerably increased its size), to his adopted daughter, Nadeïde, who had married Vladimiro Campanari, of a Russian-Italian family. The Campanaris sold off much of the land that Alexander had bought to finance building themselves a grander, though blander, villa in the early 1890s, a little to the south of Zenaïde’s villa. Their architect, fittingly, was Francisco Azzuri, the son of Giovanni. In 1922, the Campanaris sold the remaining 4.5 hectares of the estate to the German government, which soon came under pressure from its ambassador to enlarge the 1890s house so that he could entertain properly. 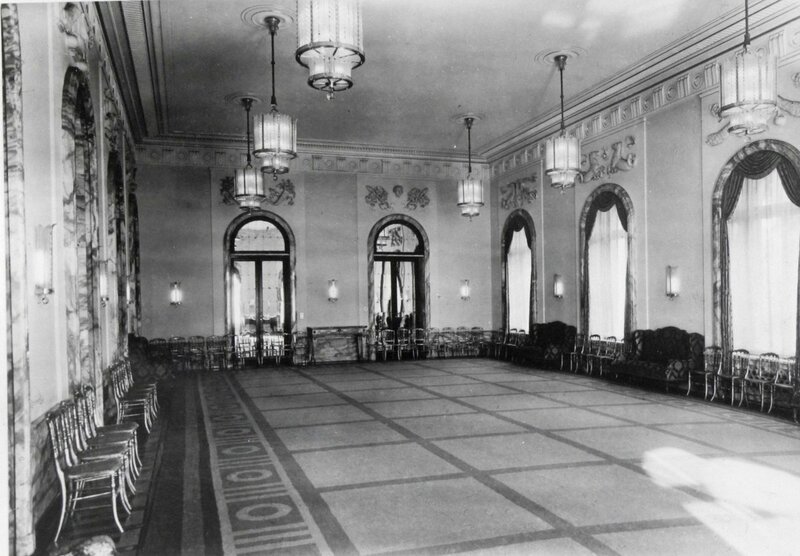 It was not until 1939-41 that plans were executed for a large ballroom to be added on one side, two drawing rooms and a study on the other, bedrooms above, and a new attic floor above the original centre part. Meanwhile, Zenaïde’s original villa had been extended to house German chancery offices, and a house for the German minister had been built. At the start of the war, hutments for more offices were erected in the grounds, a swimming pool was built, and some of the principal rooms in the residence were further embellished. 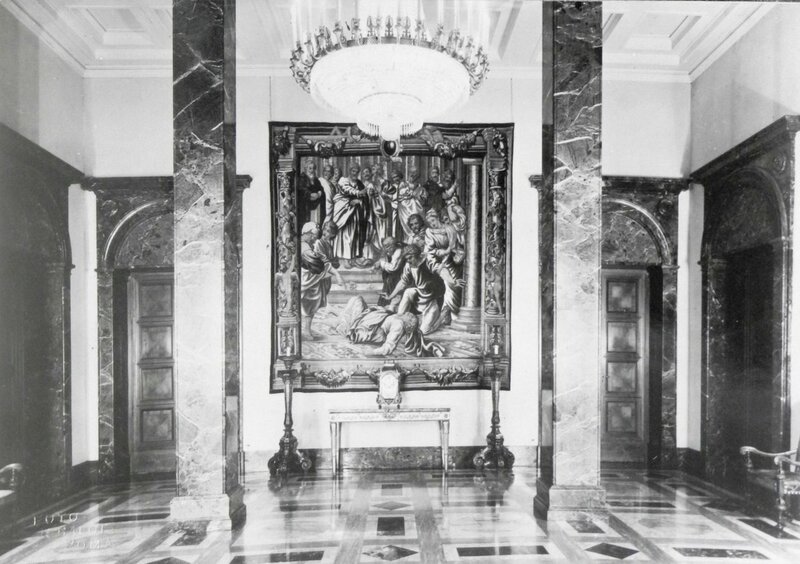 After the Germans occupied Rome in September 1943, rooms in the residence basement may have been used for the temporary detention of suspected members of the resistance before they were taken to the nearby Gestapo interrogation centre: reports of this tainted the house’s reputation for decades afterwards. After Rome was liberated in June 1944, the Italians sequestrated the Wolkonsky estate, on the grounds that it had been used for non-diplomatic purposes and entrusted it at the end of the war to the Allied Control Commission. 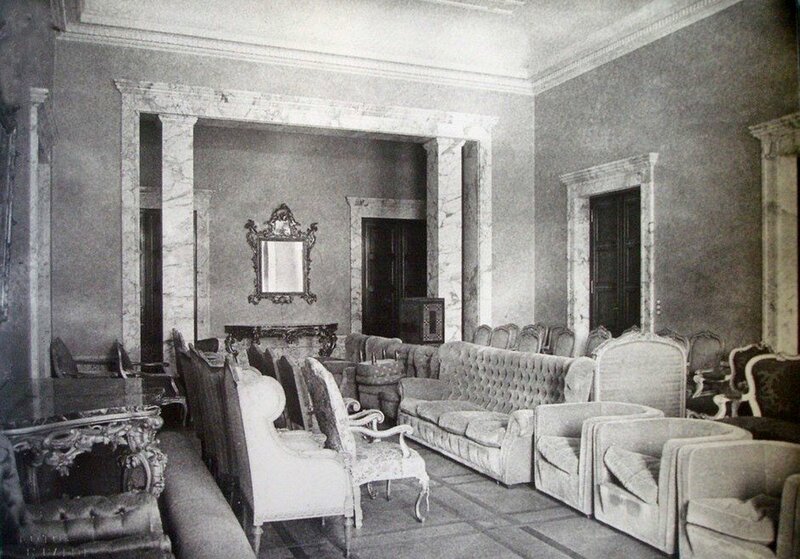 The ambassador, Charles, approached the Commission, which quickly agreed that Villa Wolkonsky should be made available to the British government, although it had only recently permitted its use by the Italian Ministry of the Treasury, who had started to move in. The Italian Red Cross also had about 100 men sleeping in the hutments in the villa’s grounds. 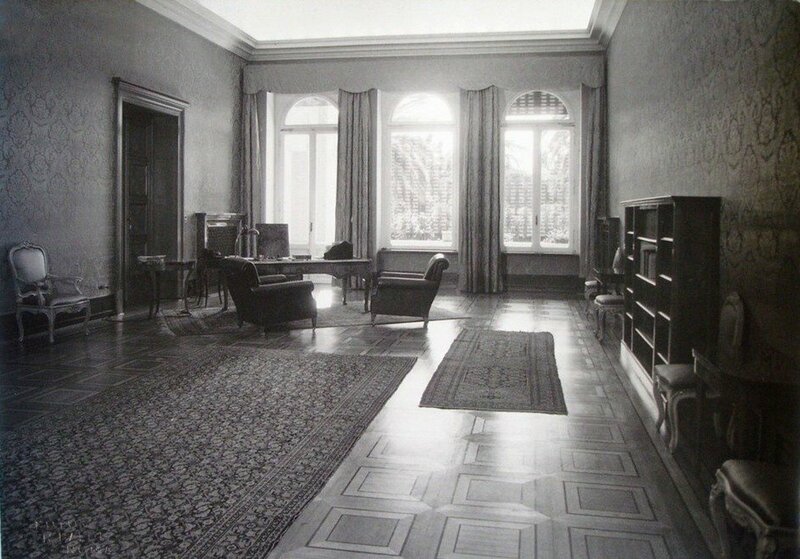 It was not therefore until January 1947 that the estate became vacant and most of the British embassy moved to it: the residence into the large 1890s villa, chancery offices into Princess Zenaide’s 1830s villa, and other offices into the hutments and the former German minister’s house. 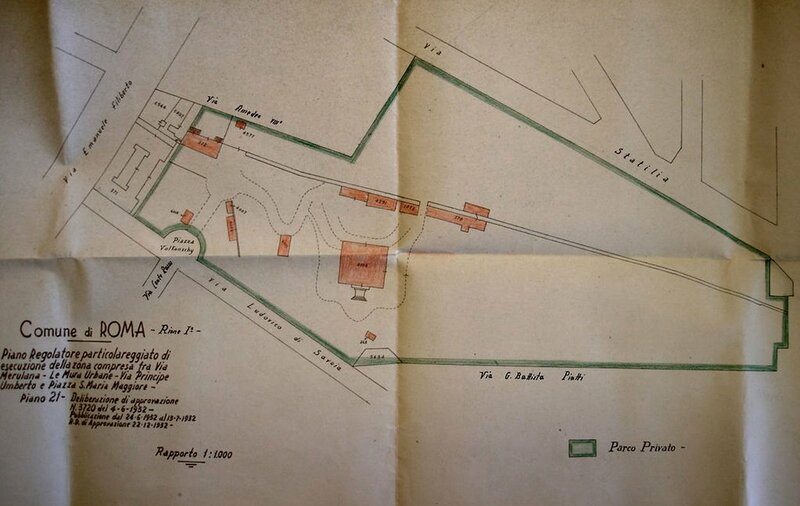 The Villa Wolkonsky suited the British embassy so well that, within three months of occupying it, Charles was writing to de Normann to suggest that it might make better sense to buy the Villa Wolkonsky estate and build offices on it with the proceeds of selling the Porta Pia site, rather than their present plan to rebuild offices and residence at Porta Pia as soon as possible and terminate the lease on Villa Wolkonsky. In July 1947, Charles amplified the pros and cons of buying Villa Wolkonsky. He thought that it had over-riding advantages: it would be cheap to acquire; it looked and felt like an embassy; there was plenty of room to build new offices without spoiling the gardens; it could be well secured from physical attack; the gardens were great for the welfare of staff; the residence was very convenient for entertaining; and, relatively for Rome, the whole property was quiet and peaceful. Among the fewer disadvantages was that it was a bit far from the centre of the town and from most residential districts ‘… and so long as Rome transport remains crowded and Mediterranean in character (as it may well do for an indefinite number of years), girls of the kind sent to work abroad these days will probably have to have special transport provided, at considerable cost, to ferry them between their homes and the office’. Charles began exploring the possible purchase of the estate. 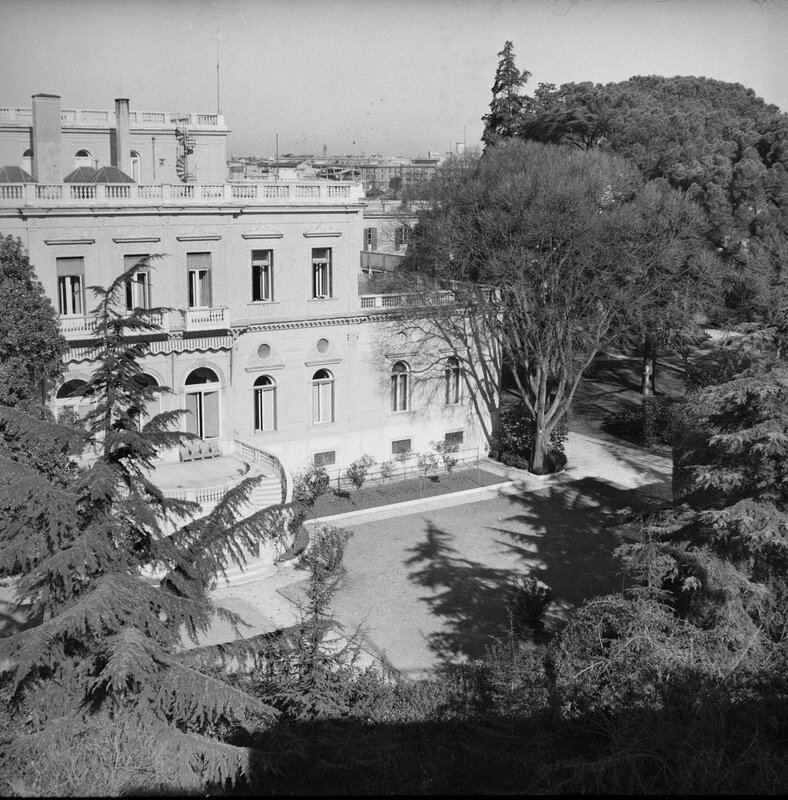 He soon saw scope for a deal with the other Allies on the Commission, reporting in September 1947 that ‘we know that the French wish to purchase the Villa Bonaparte, whilst the Americans wish to promote the purchase, at a low price, of the four German libraries in Rome for the benefit of the International Union of Institutes of Archaeology’. 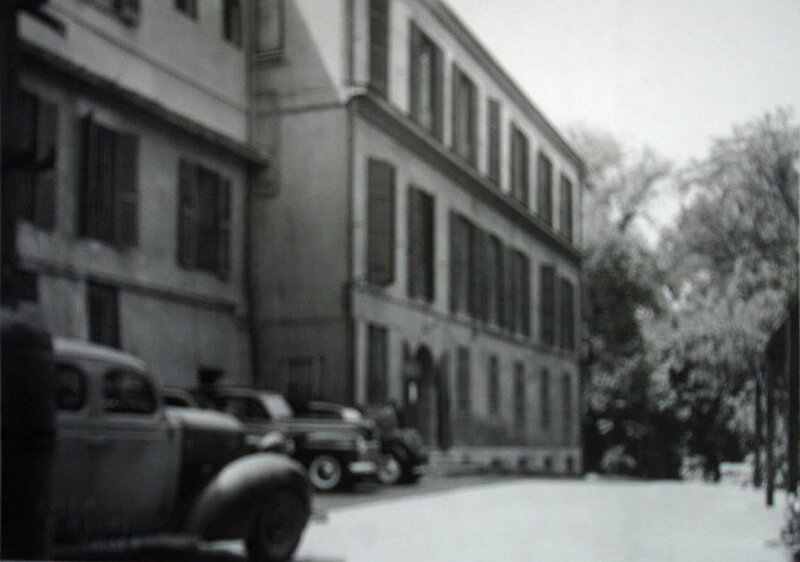 De Normann visited Rome at the end of September 1947 and agreed to support buying Villa Wolkonsky because he liked the potential of its residence but he would not budge from his view that the offices should go into a new building on the Porta Pia site. He discussed the negotiations that would be necessary to buy the Villa Wolkonsky with Sir Quentin Hill, the embassy’s economic adviser, who told him that, in practice, the rules were being made up as they went along as the major issues had never been properly settled. De Normann asked about the likelihood of a German claim for the return of the property once a peace treaty was signed and was told that the Caffarelli Palace, taken from the Germans after the First World War, was a good precedent for such property not being returned. Purchase negotiations, largely conducted through Washington, drifted on through the next few years. The British government agreed to pay £190,000 for Villa Wolkonsky (and £18,800 for Villa Crispi in Naples). De Normann’s earlier suspicion about the German reaction had been prescient. In February 1951, Sir Ivone Kirkpatrick, British high commissioner in Germany, received a letter from the German Federal Chancellor requesting that the buildings in Rome (and Naples) be released from sequestration and returned to the Federal Government. The response was a brisk negative, the purchase deal was finalised the following week, and payment made for the two properties on 28 February 1951. A confirmatory Note Verbale of 18 January 1952 recorded that decree number 1525 of 20 July 1951 recognised the British government as the owner of the Villa Wolkonsky (and of the Villa Crispi). In 1958, an extensive landscaping and tree planting scheme was undertaken to protect the privacy of the Villa Wolkonsky from an eight storey block of flats being built opposite. The aqueduct was also in poor condition, and the debate about how to restore it revealed significant differences between Italian and British approaches. The Italians were quite happy to prop up a structure with visible means or to use modern materials visibly while the British preferred to use hidden means so that the structure continued to look old and partially decayed. The restoration began in 1958 and took a full year, under the supervision of the Ministry of Works’ Ancient Monuments Branch, undertaking its first job outside the United Kingdom. I am indebted to Sir John Shepherd, who is researching a wider history of the Villa Wolkonsky estate, for his advice on this page. 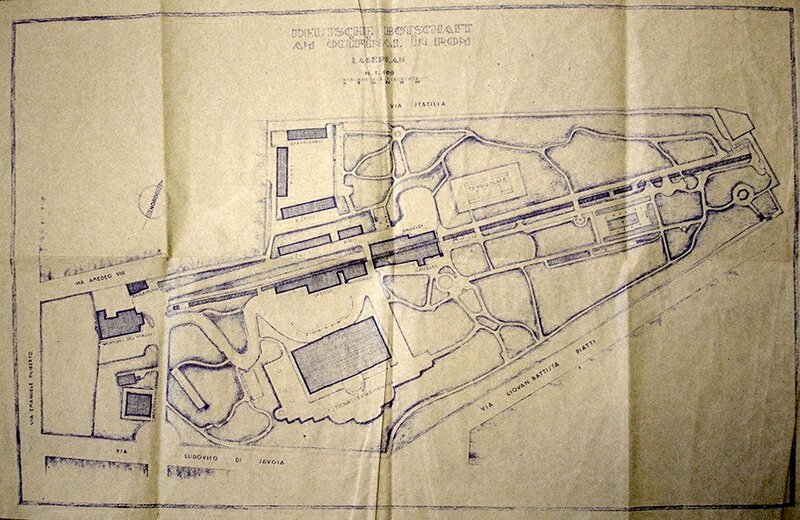 Siteplan of Wolkonsky estate, before enlargement of the villa, 1932. Siteplan, after enlargement of the villa, c.1940. Entrance side to Princess Zenaide’s villa, 1948. Entrance front to the villa, 1947. 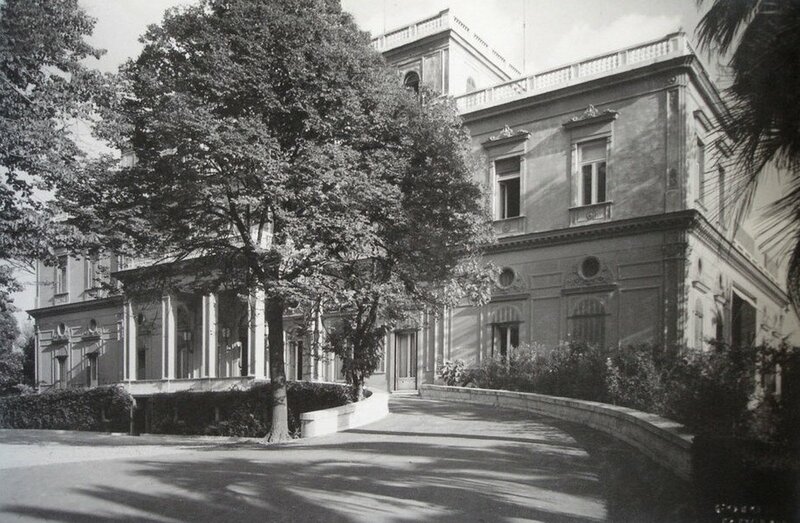 Garden front of the villa, 1958. 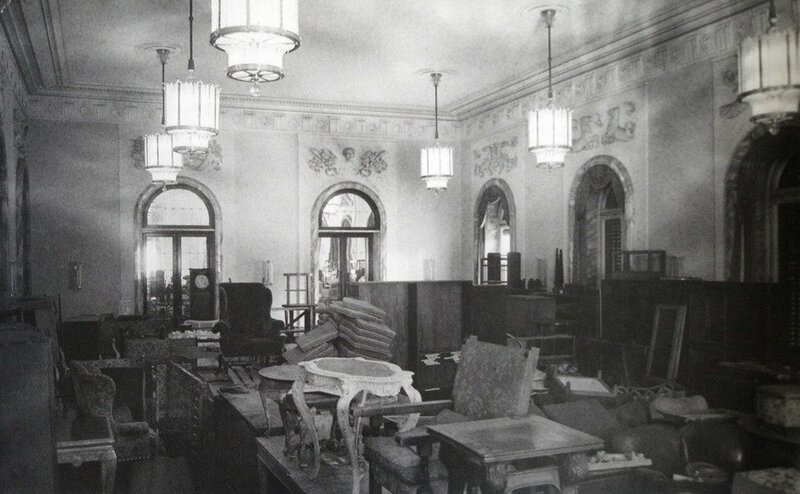 The large drawing room, 1947.